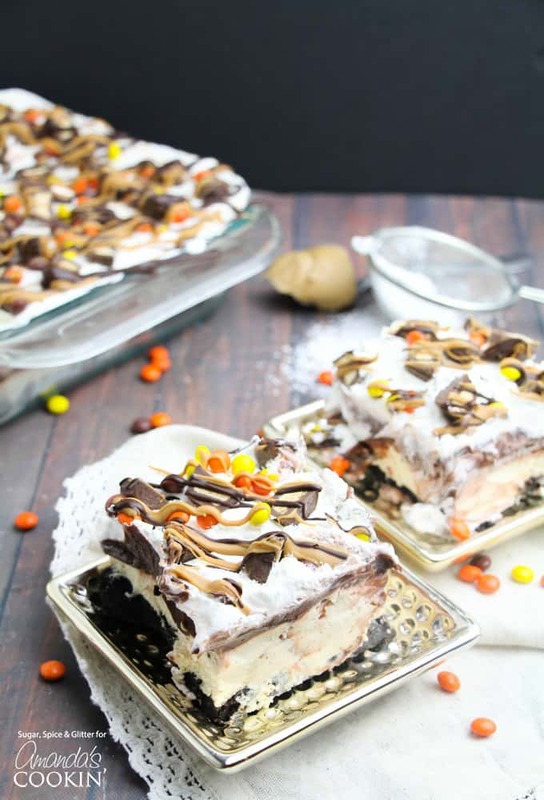 Chocolate Peanut Butter Lasagna: the perfect flavor combo in one pan! Peanut butter and chocolate is one of those flavor combinations that work perfectly to create something that is better than either of them individually. 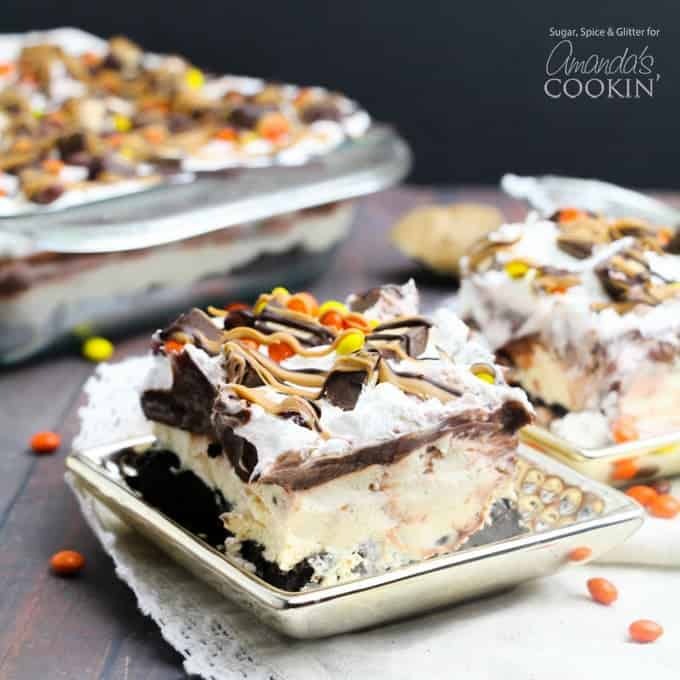 This easy no-bake chocolate peanut butter lasagna is bursting with peanut-butter-chocolate-goodness just like this Chocolate Peanut Butter Fudge! You start with a crunchy, OREO-cookie crust, then top it with a cream cheese-peanut butter layer that is smooth and out of this world amazing. Next, top it with chocolate pudding, Cool Whip, and copious amounts of peanut butter chocolate candies, as well as melted peanut butter and chocolate for extra good measure! Basically, you’re taking 5 different desserts that would be delicious and satisfying on their own and combining them to make the ultimate peanut butter and chocolate experience. 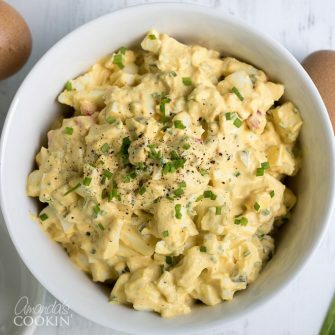 The whole is definitely better than the parts in this recipe! The peanut butter flavor in this dessert is not overwhelming and it doesn’t have the sticky texture of peanut butter. Instead, this dessert takes the best part of peanut butter – the flavor – and combines it with cream cheese and chocolate to make a perfectly balanced and delicious no-bake treat! It doesn’t matter whether you use a metal, ceramic, or a glass baking pan for this dessert because you won’t be placing it in the oven. A food processor will make creating the oreo crust a lot easier. However, if you don’t have a food processor you can place the Oreos in a gallon zipper plastic bag and use a rolling pin to crush them into crumbs. Then use a wooden spoon to mix in the butter. I prefer to use my KitchenAid mixer for creating the peanut butter and cream cheese layer, but a hand mixer does the job just as well. Be sure that you buy instant pudding mix and not the cook and serve type. While we use candy melts in this recipe, you can use a nice dark chocolate melted in the microwave. Or if you prefer a fancier look, use a vegetable peeler to shave bittersweet chocolate for the topping. 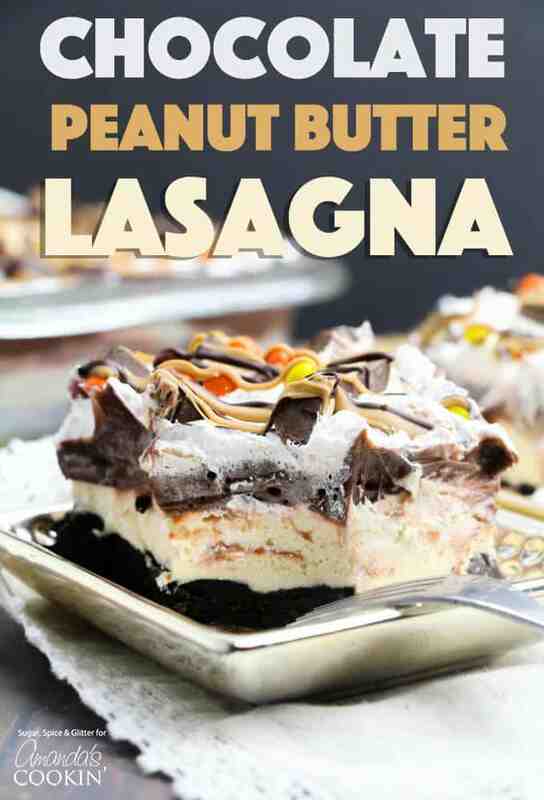 If you are traveling with this chocolate peanut butter lasagna, be sure to keep it in the refrigerator until you are ready to leave. If possible, transport in a cooler with ice if your trip is longer than 30 minutes. When you arrive, pop it in your hostess’ refrigerator. If by some miracle you have leftovers, this lasagna dessert should be good up to 4 days covered in the refrigerator. Want more peanut butter chocolate dessert recipes? Make sure to check out these delicious Chocolate Peanut Butter Cookies, they’ll have your mouth watering in peanut butter chocolate goodness! If you’re a peanut butter only fanatic try our Peanut Butter Dip, or our soft and chewy Classic Peanut Butter Cookies, both of which are a FAVORITE around here. Creamy peanut butter paired with crisp apples makes an ultra-yummy snack. Last but not least, our Peanut Butter Ice Cream Sandwich Cake is one of those desserts that you CAN’T go wrong with! 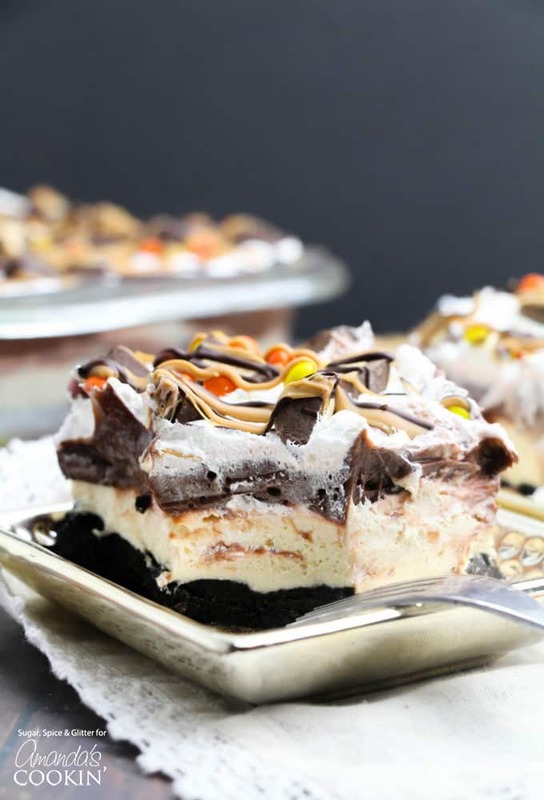 Or, for a decadent chocolate lovers dessert- No-Bake Chocolate Eclair Cake. This one speaks for itself, am I right? This chocolate eclair cake will be a delicious addition to your next gathering. This easy no-bake chocolate peanut butter lasagna is bursting with peanut-butter-chocolate-goodness. You can never go wrong with peanut butter desserts! Line a 8x8" baking pan with parchment paper and set aside. Place the OREOs and 3 Tablespoons of the butter in a food processor and blitz until a ball of dough forms. Add additional tablespoon of butter as needed. Fold the OREO dough out into the casserole dish and press down to form a even "crust" layer using a spatula or wet hands. Combine the cream cheese, powder sugar and peanut butter until smooth, about 2 minutes. Fold in 1 cup of the cool whip until fully incorporated. Set aside. Prepare the chocolate pudding layer by whipping the pudding mix and milk for 2 minutes until thickened. Remove the baking dish from the fridge and assemble the layers of your dessert. Pour out the peanut butter-cream cheese mixture over the chocolate cookie crust and smooth down using an offset spatula. Next, add the pudding layer and then add the remaining 1 cup cool whip as the final layer and smooth down. Measure out the candy melts into one small microwave-safe dish, and then the chocolate chips into a second. Melt the candy melts and chocolate chips in the microwave, heating for 25 seconds and then stirring, Repeat as needed. Stir in enough shortening to make the candy melts and chocolate chips easy to drizzle. Allow to cool but not harden as you prepare the peanut butter cups. Chop all of the mini PB cups in half and then remove the casserole dish from the fridge. 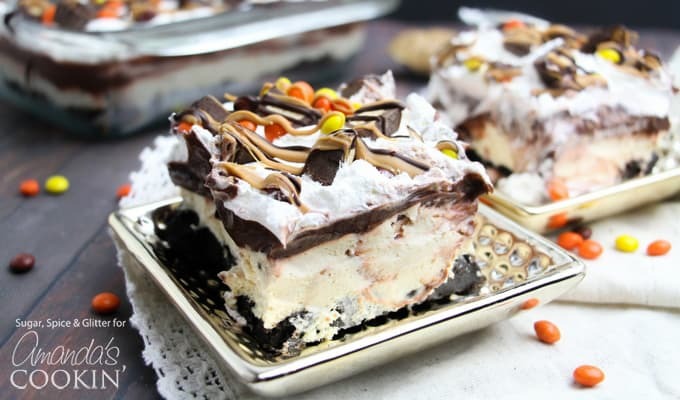 Sprinkle the PB cups and Reese's Pieces overtop of the Cool whip layer and then drizzle the peanut butter candy melts and melted chocolate chip overtop. I made this to take over to our friends tonight when go for dinner and I can’t wait to try it. One thing I did notice is that you mention it’s time to start layering the dessert, the step of putting the pudding on is missing. It say to put the cream/cheese cool whip mixture and then it says to put 1 cup of cool whip then put remaining cool whip on top without mentioning the pudding layer. I figured it out but if you just read through quickly it would be easy to mess up without it written out. Really yummy looking dessert! So tempting! OMG Yuhuhummmm Jennifer and Amanda…and killer pics too! Really nice job on this one! My bf would go crazy for this dessert!